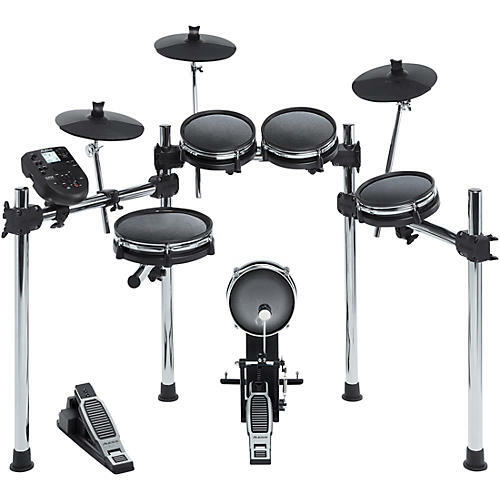 The Alesis Surge Mesh Kit is a complete 8-piece electronic drum kit featuring dual-zone mesh head toms, dual-zone mesh snare drum, and 8” mesh kick pad. Mesh head drums are the proven best choice with electronic drummers for their natural feel and ultra-quiet response. Alesis rounds out the kit with three cymbals, kick drum pedal, and hi-hat pedal. These all mount to an included 4-post chrome rack that is quick and easy to assemble. The included cable snake conveniently connects this drum kit to the powerful Alesis Surge electronic sound module, with hundreds of percussion sounds, 40 different kit (24 Preset + 16 User), 60 built-in play-along tracks and an auxiliary input so you can play with your favorite music.